Mattioli has always insisted that he will never sell the historic Pennsylvania speedway or relinquish either of its two annual Sprint Cup dates. But today’s comments, combined with rumors of a major Sprint Cup Series schedule shakeup in 2011, have put talk of Pocono’s status on the front burner once again. A day after announcing that they will not request a renewal of Gateway International Raceway’s NASCAR Nationwide and Camping World Truck Series sanctioning agreements for 2001, parent company Dover Motorsports, Inc., is reportedly asking the sanctioning body to schedule a pair of Nationwide/Truck doubleheaders at Nashville Superspeedway next season. The company has reportedly asked to host doubleheader weekends in both April and July, with Nashville relinquishing its traditional June date and assume Gateway’s July spot on the schedule. 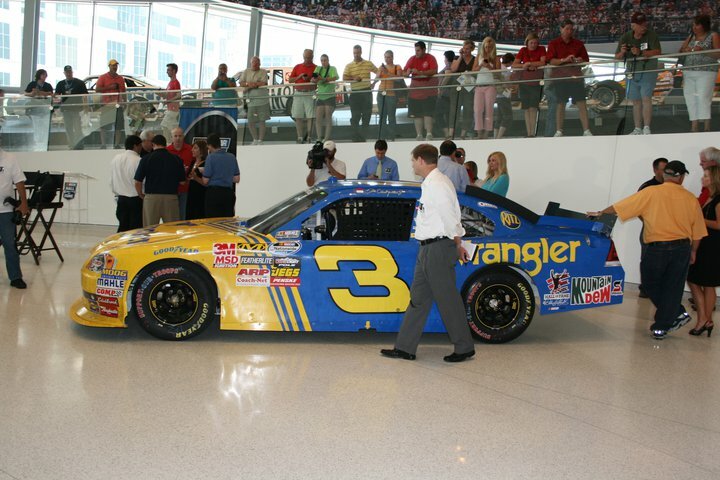 The move is subject to NASCAR approval, but sources say the sanctioning body is almost certain to endorse the move. Dover Motorsports, Inc. announced today that Gateway International Raceway has notified will not seek NASCAR sanctions in 2011for its two Nationwide Series and one Camping World Truck Series events. The track’s Vice President and General Manager, Terry Harmeson said, “This was a difficult decision in light of the many years of earnest and continued efforts on everyone’s part to develop a viable market for these events in one of our nation’s greatest cities. We plan to explore various ways to change the economics at Gateway both from the revenue and expense side.” Harmeson said the track will fulfill the balance of its 2010 schedule, including an October 23rd NASCAR Nationwide Series race. Dover Motorsports President & CEO Denis McGlynn said the company will evaluate all its options for this facility, including its possible sale. Daytona International Speedway President Robin Braig said today that he has “no intention" of swapping the track’s traditional July 4 NASCAR Sprint Cup Series date for the final race of each season. There has been speculation recently that NASCAR Chairman Brian France will move the season finales for the Sprint Cup, Nationwide and Camping World Truck Series from Homestead-Miami Speedway to either Daytona or Las Vegas Motor Speedway, beginning in 2011. Braig, however, told Sirius NASCAR Radio that he is happy with the track’s traditional “Coke Zero 400” in July and is not interested in changing dates. Homestead-Miami Speedway has a long-term sponsorship contract with Ford Motor Company to host its annual "Ford Championship Weekend," but that contract is reportedly contingent on the track hosting the final races of the season for all three of NASCAR's national series. 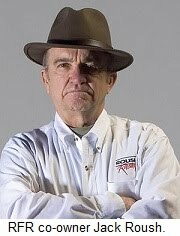 Roush Fenway Racing co-owner Jack Roush is hospitalized today following a plane crash at Wittman Air Field in OshKosh, Wisconsin at approximately 6:15 p.m. CT yesterday. 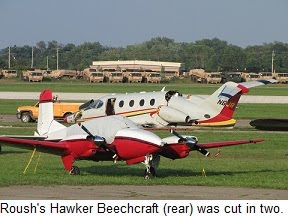 Roush was piloting his own Hawker Beechcraft Premier jet to an Experimental Aircraft Association show, was landing his when the accident occurred. Eyewitness Roger Florkiewicz told local television station WFRV-TV 5, “The right wing tip hit the grass to the right of the runway. Immediately after, the nose hit and it cartwheeled tail over nose, and then skidded to a stop." A bloodied Roush exited the heavily damaged aircraft under his own power, as did his passenger, secretary Brenda Strickland. Both were transported to a local hospital. Roush is listed in serious but stable condition, while Strickland reportedly suffered non-life threatening injuries. Roush Fenway Racing President Geoff Smith told the Associated Press that Roush’s injuries could require him to undergo surgery, but attending physician Dr. Kevin Wasco said those injuries were also non-life threatening. The National Transportation Safety Board is investigating the incident, Roush’s second serious crash in the last eight years. In 2002, he was critically injured after crashing an experimental plane into a pond near Troy, Ala., on his 60th birthday. Retired Marine Larry Hicks witnessed that crash, paddled a boat to the scene and repeatedly dove through a layer of spilled jet fuel to pull Roush from the submerged wreckage and perform lifesaving CPR. You can view CNN's video of Roush and Strickland exiting the aircraft by clicking HERE. Warning, the video is somewhat graphic and not suitable for some viewers. 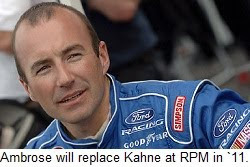 Sirius NASCAR Radio’s Sirius Speedway with Dave Moody has learned that Marcos Ambrose will replace Kasey Kahne in the #9 Ford at Richard Petty Motorsports next season. 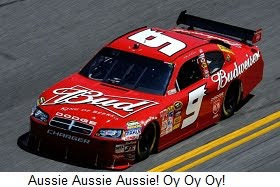 Ambrose said he has no “Plan B” in place for 2011 and could even return to his native Australia if another Sprint Cup opportunity does not surface. Highly placed sources tell Sirius Speedway that a deal with RPM is “95 percent done,” though there is no definitive word on who might sponsor the effort. Randy Moss Motorsports V.P. Says Reports Of Possible Sale "Inaccurate"
Sources tell Sirius NASCAR Radio’s Sirius Speedway with Dave Moody that talks have taken place between RMM and Turner Motorsports owner Steve Turner about a merger or outright sale of the team, which fields Toyota Tundras for veterans Mike Skinner and David Starr. Moss reportedly declined to assume a larger role in the financial operation of the team recently, leaving co-owner David Dollar to handle the day-to-day funding and operation of the team by himself, with Moss serving as little more than a figurehead. While declining to comment specifically on those reports, Wile said Randy Moss Motorsports is in better financial shape than many on the circuit. “We have been very fortunate,” he said. “With support from Toyota, International Trucks, Zachry, Monaco RV, PC MILER Navigator, Exide Batteries and others, we’ve been able to weather these tough economic times better than most. Dale Earnhardt, Jr.'s Wrangler retro-themed Nationwide Series car now resides (temporarily) in the NASCAR Hall Of Fame! 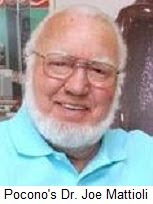 NASCAR Historian Buz McKim joins us in Hour Three of today's show to talk about how it all happened. They're tearing up the asphalt at Daytona International Speedway today, exposing the linestone base below. 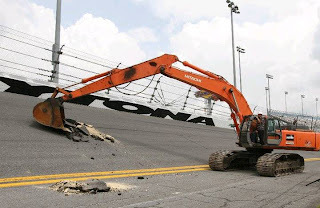 It'll all be gone and replaced in time for the 2011 Daytona 500! 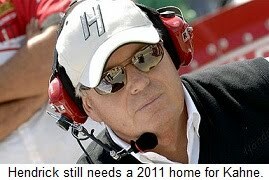 Tony Stewart said last week that Stewart Haas Racing has no plans for a third NASCAR Sprint Cup team in 2011. There has been rampant speculation that SHR could be home for Kasey Kahne next season, filling the one-year gap between Kahne’s departure from Richard Petty Motorsports and his 2012 debut with Hendrick Motorsports. But Stewart said there was “probably a zero percent chance we'll expand to a third team for next year,” adding that the team is still seeking a sponsor to replace Old Spice, and that there are unsponsored races on Ryan Newman’s car, as well. “We're talking to a lot of great people (and) there's a lot of good opportunities out there,” he said. “It's just a matter of finding a package that works for somebody.” He said Stewart Haas Racing could ramp up to three – or even four – cars very quickly, but not without having the proper funding in place. With SHR apparently out of the running, where will Kahne end up in 2011? 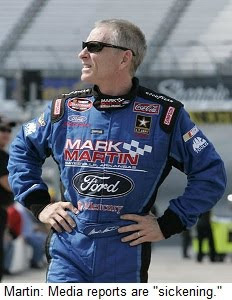 Rumors continue to circulate through the Sprint Cup garage that Rick Hendrick has offered Mark Martin options to vacate the seat in the #5 Chevrolet a year early for another ride, allowing Kahne to drive the car next season. Martin has repeatedly denied those reports, saying he intends to fulfill the balance of his contract with HMS. “Randy Pemberton went on Sirius NASCAR Radio the other day and said Mark will be driving for Red Bull next season,” said Ertel. “There’s not a shred of truth to that statement, and he never bothered to ask Mark, Rick Hendrick or anyone else about it. If he had asked, he would have been told -- in no uncertain terms -- that it was a load of hooey. Sources with Hendrick Motorsports also denied reports of Martin’s departure today, and vowed that the #5 team will not allow the constant media speculation to become a distraction. There is a rumor born every minute in the NASCAR Sprint Cup Series garage, and the media has every right to investigate and report on each and every one of them. It seems clear, however, that Martin intends to finish out his contract with Hendrick Motorsports by driving the #5 Chevrolet next season. With that said, it seems that Kahne will only drive for Hendrick next season if Martin is forced out of the ride against his wishes. Rick Hendrick has been a team owner in NASCAR since 1984, and has never shown a propensity for that sort of cold-blooded backstabbing. Congratulations to our girl Amber Colvin on her recent win at Atlanta Motor Speedway. 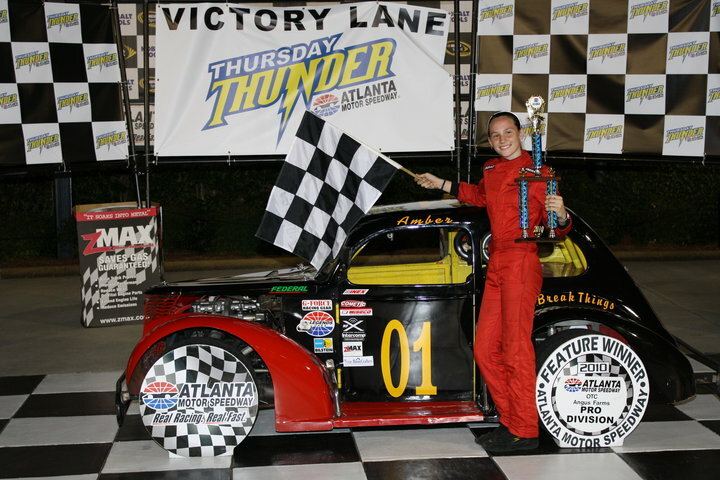 The 2010 winner of NASCAR's Young Racer Award, Amber is now the top-ranked female Legends Semi-Pro racer in the country. Yet somehow, she has not been able to find anyone to sponsor her. Can your company help? The 2011 NASCAR Sprint Cup Series schedule is expected to include at least two new events, in Kentucky and Kansas, after NASCAR Senior Vice President of Racing Operations Steve O’Donnell said last week that both Speedway Motorsports, Inc. and International Speedway Corporation have submitted official requests to relocate races to those tracks in 2011. Rival International Speedway Corporation will also transplant a race next season, adding a second Sprint Cup date at Kansas Speedway. ISC is constructing a $521-million hotel and casino overlooking the track’s second turn, and the addition of a second Sprint Cup Series race there was listed as a contingency in their application for a Kansas Gaming License. 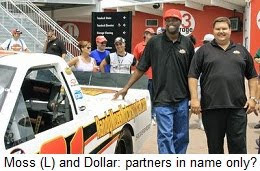 ISC spokesman Lenny Santiago confirmed the move last weekend at Daytona International Speedway, saying, "We're hopeful. We've been working with NASCAR and recently made our formal request to them. We're not discussing the details of where the date may come from, but we have made the request and we'll wait for their decision." ISC owns Daytona, Talladega, Auto Club, Martinsville, Richmond, Michigan, Phoenix, Watkins Glen, Darlington, Chicagoland and Homestead-Miami Speedways, with Auto Club, Martinsville and Michigan believed to be most likely to forfeit a date. Martinsville President Clay Campbell said recently that he has heard nothing from ISC about losing a race, and would almost certainly have been informed of such a move by now. MIS spokesmen say they too are proceding under the assumption that they will host two Cup dates next season. Multiple sources say the 2011 Kansas race will come from Auto Club Speedway in Fontana, California, which has struggled to fill seats since adding a second Sprint Cup date a few years ago. Moving races from track to track – while sometimes unpopular – is a relatively simple undertaking. Juggling the schedule to avoid conflicts and accommodate each track’s unique weather, logistical and financial characteristics will be far more difficult. Kansas Speedway is physically incapable of hosting events in February or March, since the area is often adrift in snow at that time of year. The track already hosts a Sprint Cup race in early October, meaning that a second Sprint Cup date will probably have to be scheduled early in the season; in April or May. Kansas already hosts an Izod IndyCar Series event the first weekend of May, raising the possibility of a NASCAR/IRL doubleheader. In order for that to happen, however, Richmond’s May Sprint Cup event will have to be moved. A more likely scenario involves eliminating the February race at Auto Club Speedway, moving the spring Phoenix International Raceway event to that weekend and giving Kansas PIR’s traditional April slot. Kentucky’s scheduling logistics will be less difficult; a simple case of transferring New Hampshire’s late June date to the Bluegrass State. The track’s schedule will easily accommodate the move, since Kentucky currently hosts only a NASCAR Camping World Truck Series/IRL IndyCar doubleheader the first weekend in September. There will be some public relations hurdles to be cleared, however. Northern New England race fans have snapped up virtually every NASCAR Sprint Cup Series seat ever offered at the Magic Mile since it was added to the schedule in 1993, and they will not take the loss of one of their races sitting down. 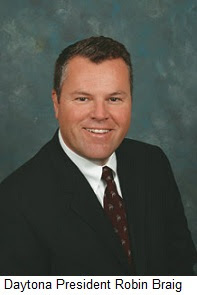 Smith is likely to use Loudon, NH, Police Chief Bob Fiske as a scapegoat for the move, blaming an ongoing dispute over the cost of police services for his decision to transfer a date, but public opinion in the Granite State has recently begun to sway heavily against the controversial track owner. Sources say Smith met with NASCAR officials two weeks ago in New Hampshire to discuss proposed realignment scenarios, and ironically, it appears Granite State fans will lose one of their races the same way they required it. The Loudon oval added a second Sprint Cup event to its schedule in 1997, after Smith and then-NHMS owner Bob Bahre purchased the legendary North Wilkesboro Speedway, shuttered the venerable oval and moved its two NASCAR races to New Hampshire and Texas.